Many people using laptops with touchpads for gaming (even just Facebook) complain about not being able to press keys and move their “player/character” with the touchpad simultaneously. This is not the same problem. The problem about being able to (for example) press the “W” key to move forward, while changing direction using the touchpad is typically a driver issue, where the touchpad is disabled automatically when they keyboard is used. The intent is to prevent inadvertent movement of the cursor by the typist if his/her hand accidentally brushes the touchpad while typing. This problem is (relatively) easily fixed by unchecking the “disable touchpad while typing” setting in your touchpad’s settings. Now click on “PC and devices” (should be near the top left in the PC Settings window. 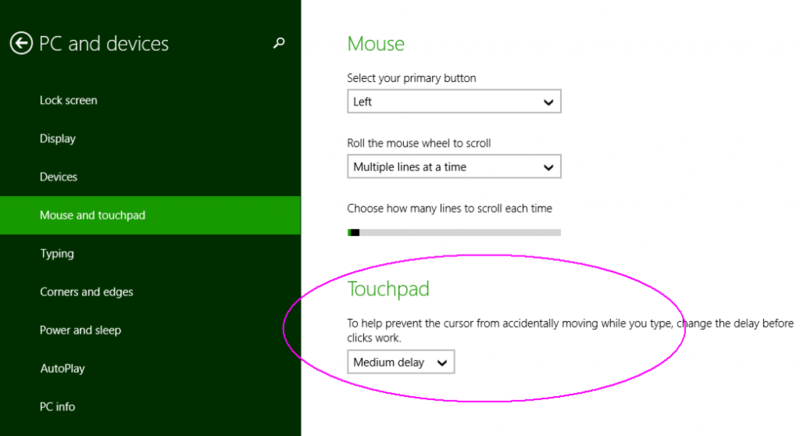 Click on “Mouse and touchpad” (about halfway down the left side settings in the PC and devices window. On the right, typically the last selection is labeled “Touchpad.” Under there is a sentence that reads ” To help prevent the cursor from accidentally moving while you type, change the delay before clicks work.” Yeah. Because I’m always banging my keys so hard that I mash the mouse buttons too. Anyhow, change the box below it to “No delay (always on)” to fix this…fix that Microsoft blessed us with. Tagged button, delay, minecraft, Mouse, touchpad, Video games, Windows 10, Windows 8. Bookmark the permalink.